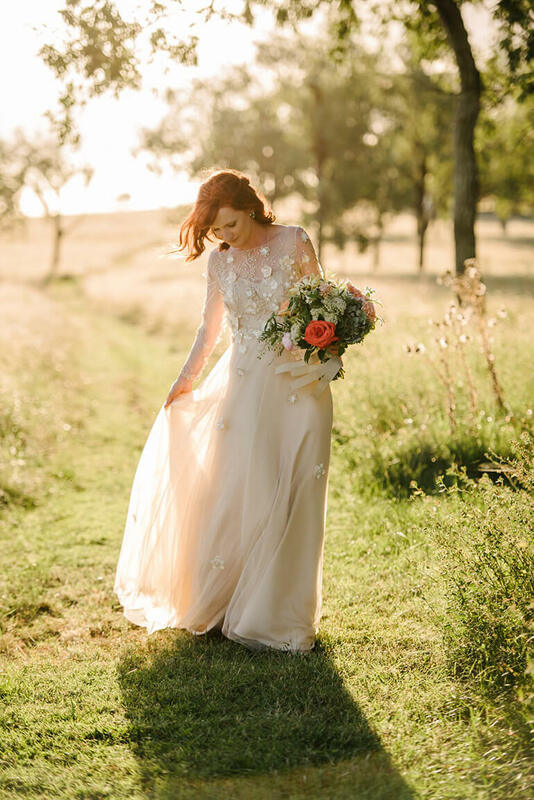 Just outside of Brisbane is where they grow ‘pure wedding magic’. If you live and work in Brisbane, then why would you want to also get married there? Just for that one ‘special day’ why wouldn’t you and your loved one want to totally escape to a romantic location that breaks free of all the city boundaries? When you look beyond the city limits, you’ll discover that what’s on offer is way outside the pages of any wedding magazine. Drive beyond the skyscrapers and suburbia and you’ll find that the highway opens up to a host of different wedding day dreams. Maybe it’s a gorgeous country chapel, or romantic outdoor setting with mountains in the background. Maybe you’d love outdoor dining under a star-filled sky, or inside an elegant barn with rustic chandeliers and stone fireplaces. That’s certainly something you won’t find that in the city venue. In the country there are as many photo opportunities, as there are stars in the sky. You won’t have to worry about hiring a backdrop, because the options are endless. And forget about trying to create some type of atmosphere in a city venue. Why not escape the maddening crowd to find so many more wonderful choices? – whether it be relaxed, elegant, intimate, formal or fun. In the country, you’re free to create. 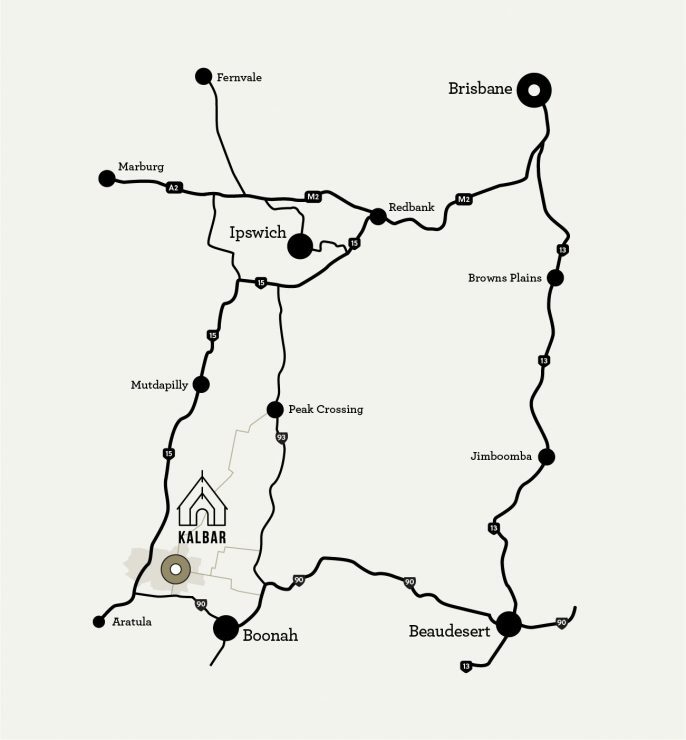 So, start driving and in just under an hour out from Brisbane, you’ll find a small, historic town that specialises in personal and beautiful ‘forever days’. 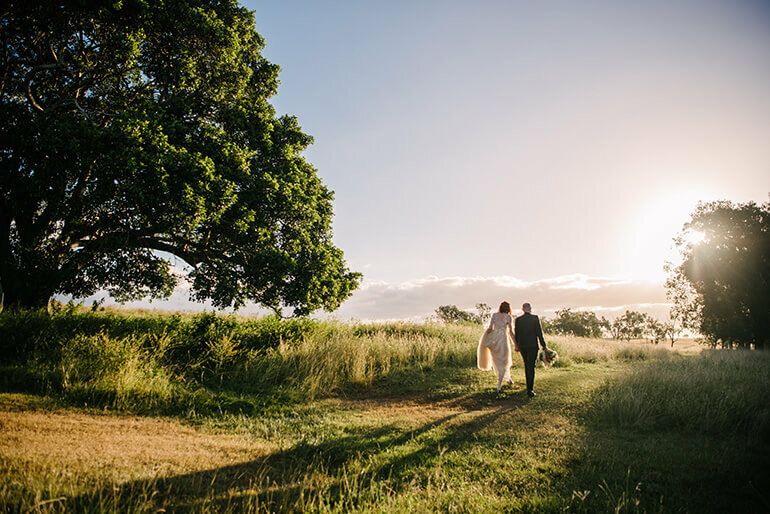 White Chapel Kalbar is South East Queensland’s newest wedding venue and it’s only 55 minutes from Brisbane. It’s located in a quaint, country town called ‘Kalbar’ located in the stunning Scenic Rim. 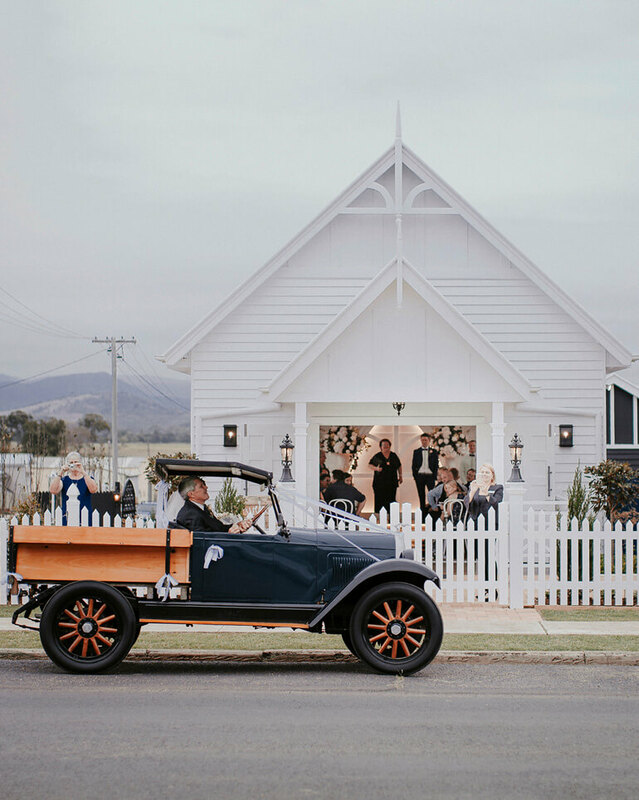 The beautifully renovated 134 year-old country church is now ‘White Chapel’ wedding venue. The style is city chic meets stylish country. It boasts all the romance of a cute country church, but offers all the style, mod cons, technology and creature comforts you’d expect from the very best high-end city venue. Another bonus is that your wedding party doesn’t have to travel anywhere to the reception, because the gorgeous Black Hall is right on site. 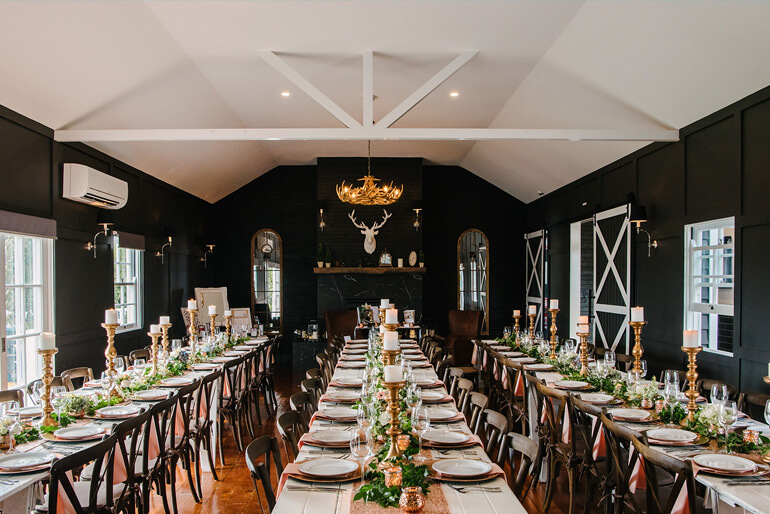 The 1934 Sunday School hall has been transformed into an elegant, country hall that boasts a 6-star hunting lodge design. Black panelled walls, antler chandelier and fireplace complete the picture. Our outdoor pergola is the perfect place for cocktails and there’s an outdoor wood-burning fireplace to mingle around. And for those wanting more options, there’s our rustic bar called the ‘Barn Bar’. You’ll love the hand-made pressed metal bar, the antique roll-top bath for drinks & the vintage ladder chandeliers. The perfect backdrop for wedding pics and celebration drinks. There’s also a manicured lawn area called ‘The Grounds’ which is ideal for wedding games and can even accommodate a dreamy, outdoor wedding. And where would your guests stay? Well, there’s 120 beds within 15 mins of White Chapel and we have our own 24-seat bus to transport your guests to and from the venue. So, stop dreaming and get into your car. Remember, it’s closer than the mountains of Maleny and closer than any of the coasts! Your wedding photos wouldn’t look like all of your friends’ shots and the day promises to be like any other. Why not arrange an inspection at White Chapel? You might just fall in love, all over again.